During 24–27 September, RaySearch will be exhibiting at the ASTRO 2017, the Annual Meeting of the American Society for Radiation Oncology, in San Diego, US. Among other highlights, the company will present its next-generation oncology information system, RayCare®*, which will be released in December 2017. Attendees are welcome to visit RaySearch at booth #1647 and demonstrations can be booked now at www.raysearchlabs.com. RayCare is a machine-learning oncology information system created to support every step of cancer care and enable truly comprehensive treatment organized around each patient’s needs. RayCare integrates seamlessly with RayStation, but that’s just the start. The system is designed to connect all the oncology disciplines, fluidly coordinate tasks and ensure optimal use of resources. RayCare will consolidate the multiple software systems that are commonly in use, including systems for medical oncology, radiation oncology and surgical oncology. Integrating the varied activities in these workflows saves time, reduces complexity and minimizes the risk of errors that can occur when transferring information between systems. And with a wide range of data immediately accessible to everyone who needs it, RayCare will bring adaptive treatment within reach for every clinic. The latest RayStation innovations will all be on show at ASTRO. Key features in RayStation 6 include support for TomoTherapy. This addition made RayStation the only system to enable planning for both conventional linacs and TomoTherapy systems, giving one point of control for all treatment planning activities. RayStation 6 also features MR-based planning, which makes it possible to use an MR image as the planning image for photon therapy as well as simultaneous optimization of multiple beam sets for SMLC, DMLC and VMAT. Other highlights include Monte Carlo dose calculation for proton pencil beam scanning (PBS) and PBS planning with block apertures. RayStation is designed to make adaptive therapy easy to implement and perform in clinical practice. At the RaySearch booth, attendees can discover how automation features and smart tools in the fully integrated dose tracking and adaptive planning modules make it straightforward to get started. RayCare represents the future of OIS technology, developed from the ground up to support the complex logistical challenges in modern, large-scale cancer centers. 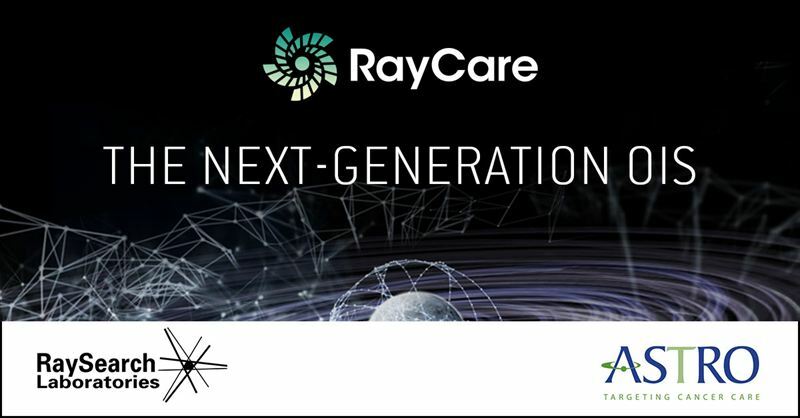 RayCare will integrate the high-performance radiation therapy algorithms available in RayStation with advanced features for clinical resource optimization, workflow automation and adaptive radiation therapy. RaySearch Laboratories AB (publ) is a medical technology company that develops innovative software solutions for improved cancer treatment. RaySearch markets the RayStation treatment planning system to clinics all over the world and distributes products through licensing agreements with leading medical technology companies. The company is also developing the next-generation oncology information system, RayCare, which comprises a new product area for RaySearch, and which will be launched in December 2017. RaySearch’s software is used by over 2,600 clinics in more than 65 countries. The company was founded in 2000 as a spin-off from Karolinska Institutet in Stockholm and the share has been listed on Nasdaq Stockholm since November 2003.